Researchers and physicians are increasingly learning that medical interventions can be more successful when they are tailored to the particular profile of the individual patient. Yet, defining that profile has proven tough, as it involves information on an individual’s genome, proteins, fats, and variety of other biomolecules that constitute the individual's tissue makeup. And so far, the only differences that have been seriously taken into account are those found between genes. Now, scientists from the Swiss Federal Institute of Technology in Lausanne (EPFL) and the Swiss Federal Institute of Technology in Zurich (ETHZ) have developed a powerful tool for exploring and determining the inherent biological differences between individuals, overcoming a major hurdle for personalized medicine. Over the years, investigators found that successfully treating metabolic disorders such as diabetes, obesity, and fatty liver has been particularly challenging due to the variation in the way patients respond to medication. The key to this variation lies in the inherent biological differences between individuals, which cannot all be explained genetically. At the same time, this variation makes it very difficult to develop “standard” treatments for certain diseases. In this new groundbreaking initiative, the EPFL and ETHZ scientists developed a strategy that could define and explain metabolic differences between individuals, essentially paving the way for precision medicine. This work, the researchers note, also highlights significant issues with animal-based drug studies. 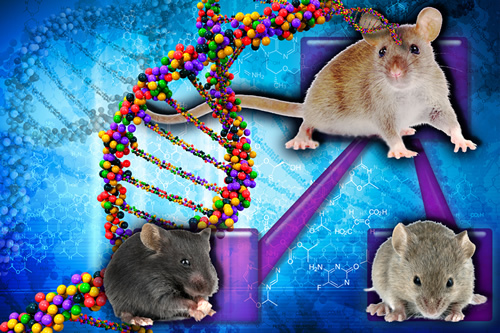 The two lab groups from the EPFL and ETHZ set out to solve the differences in genomic and proteomic variation by looking at 40 different mice strains and were successful in connecting the differences between the two. “It's much more complex to measure the set of proteins than to sequence the entire genome,” noted co-lead study author Yibo Wu, Ph.D., research scientist at ETHZ. The investigators used protein data from mice they obtained from a new mass spectrometry technique known as SWATH-MS. This is a technique that combines the advantages of high-throughput mass spectrometry with high reproducibility and consistency. In short, it can identify thousands of different proteins in hundreds of samples much faster and accurately than conventional techniques, allowing the researchers to measure the concentrations of a broad spectrum of liver proteins in the mice. The Swiss teams measured a total of 2600 different proteins from tissue samples of 40 mice strains, all of which came from the same two ancestors—meaning they all had a common genetic lineage. “We wanted to keep the genetics simple in order to observe differences in the impact of environment (diet) on the proteome, other layers of biology, and their predisposition to develop diseases,” Dr. Auwerx remarked. The mice were divided into groups of representing each of the 40 strains, and the groups were fed either a high-fat diet—essentially junk food—or a healthy, low-fat diet. Over a few weeks, the scientists charted the mice's physiological data and tested how fast they could gain weight on the junk-food diet and lose weight by exercising. Despite their similar genetic makeup, the mice on the high-fat diet showed varied responses to diet and exercise. For instance, some developed metabolic disorders like fatty liver, while others did not. Subsequently, the research groups combined the physiological data with data for their genome, their proteome, and their transcriptome, which is essentially their full set of RNAs—another biological layer in the black box. Through this combination, the scientists were able to understand better the role several proteins play when it comes to metabolizing fat and producing energy from it. “The aim here is to be able to customize medical intervention for each patient based on their individual biological makeup, the 'black box',” said Dr. Auwerx. And this is exactly what his group is currently tasked with—looking at specific drugs that can be used more effectively with this approach to treat metabolic disorders.